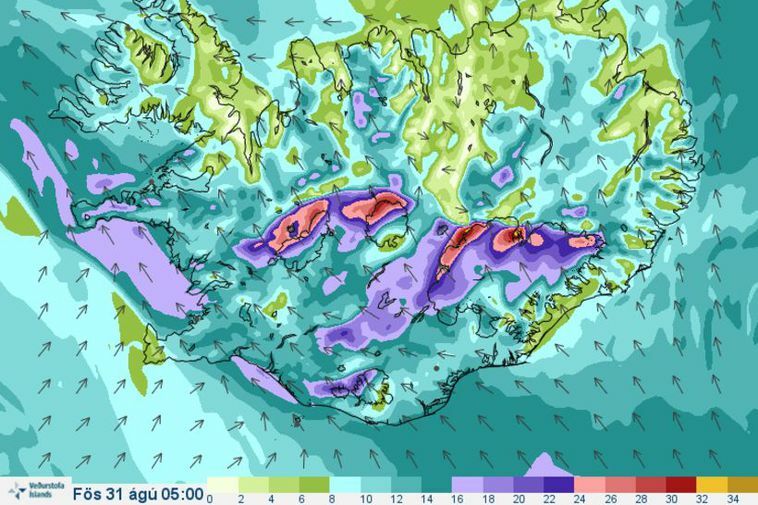 The Icelandic Met Office has issued a yellow weather alert for the Central Highlands, effective from 6 pm tomorrow night, Thursday, through 9 am on Friday. A southeasterly gale, or near gale, is expected, with wind speeds of 15-23 m/sec, accompanied by wind gusts in excess of 35 m/sec near mountains. Strong winds and heavy rain in the south can create hazardous conditions for travelers, especially hikers, cyclists and people in tents. The western part of the country, too, will see strong southeasterly winds tomorrow night, including wind gusts of 35 m/sec near mountains. The Met Office warns that these could be dangerous conditions for those who drive campers or vehicles with trailers. The website safetravel.is advises hikers and campers to postpone travel or to seek shelter on Thursday night. This goes for Laugavegur and Fimmvörðuháls trails. According to the same website, the Department of Civil Protection and Emergency Management advises against travel on Svínafellsjökull glacier, due to landslide danger, and guided tours on the glacier are discouraged. Travelers are advised to make only a short stop at viewpoints by the glacier tongue. Stay up to date regarding the latest warnings at safetravel.is. This, too, is the place to leave a travel plan. For the latest weather forecast, visit en.vedur.is.